Are you looking for the best longboard? Are you confused which longboard is the best for your riding style? A board that is best for carving would be absolutely horrible for downhill longboarding and vice versa. Novice longboarders usually have no idea where to start when it comes to selecting a board that is appropriate for them. For these reasons, we have designed this guide. Its purpose is to help you make the best decision when it comes to your longboard purchase. When an individual is first thinking about getting a longboard, there are certain characteristics that they should expect the board to have. One of the first things that they want to look at is how durable the board is. Next, they want to examine the wheels. Big wheels that are soft and that have smooth, durable bearings will help lower the learning curve for beginners. A good longboard for beginners will typically be on the longer side and somewhat wider than other boards. Also, while the temptation exists to purchase the most expensive board out there, it may be wise for a beginner to look at a longboard that is an average, or low price. These boards are guaranteed to get a new skater out of the garage and skating down the road with ease. Carving longboards are designed for individuals who are looking to do more technical moves on the board. They have been designed to allow the rider to curve and make tight turns in a way that simulates how surfers are able to turn and make tight curves on the water. Cruising longboards are an all-around general purpose skateboard, which is designed as a good source of transportation and a good way to have a little fun. These boards have been designed to allow the rider to have the most exhilarating experience while on the board. Speed is the number one characteristic that these boards bring to the table. Downhill longboards are considered to be an advanced board and may pose a challenge for newer skaters. They will work best on racetracks, skateboarding areas, and on larger hills. If you are interested in doing some of the more technical tricks that can be done on a board, then you may be interested in looking at a freeride longboard. These boards are designed to allow the rider to do multiple tricks in quick succession. The tricks performed on these boards often are made up of a series of slides that are done at differing speeds. Technical tricks can be performed with freestyle longboards. Many of the tricks that riders perform on these boards are offshoots of some of the most traditional skateboarding tricks out there. Included in this would be popping the board up off the ground and forcing the board to do multiple flips or spins while in the air. Up until now in our guide, you have seen that there are many different types of longboards. Each longboard has situations that it works ideally in and others that they do not work so well in. The same principle applies to the longboard brands that are out there. There are many good longboard brands available. Each brand of board is made for individuals of a different skill level. There are brands of longboards that are ideal for individuals who are starting out, and there are brands that are better for individuals who are skating at an advanced level. Sector 9 started out with a bunch of good friends hanging out in their La Jolla backyard. One of the guys would teasingly refer to the others as nine balls and the area where they all hung out as “sector 9”. The name stuck, and a revolution in longboards began. Sector 9 is perfect longboards for beginners. They have a sturdy design and are made from quality materials and are more affordable than some of the higher-end brands. A great example of a good Sector 9 board for beginners is the Fiji. This is a perfect cruising board that is designed to allow the rider the ability to effortlessly enjoy a smooth ride. It set a tad bit high off the ground, so at first, a beginner may have to put forth a little bit effort to get the board going. But once they get going, the board will carry them far. Many riders refer to Sector 9 boards as the gateway board. Sector 9 boards provide an inexpensive way for new riders to discover longboard. They allow beginners to get a feel for the type of style they like without the expense of some of the higher-end boards. Diversity is the name of the game where Landyachtz longboards are concerned. These boards are so popular because just about any rider can find a style of board that suits him, and it will be at a price that matches his budget. Landyachtz prides themselves on being able to produce innovative, unique designs. Their goal is to create eye-catching decks that still maintain the functionality one would expect from a high-end longboard. Landyachtz can set the rider back anywhere between $170 and $300 plus. On the lower end is the Bamboo Totem longboard. Designed for beginners who just want to get a feel for what longboarding is like. This cruising board is not designed to bomb down hills or slide. But it’s a perfect beginning board for someone who is looking to get their feet wet. Landyachtz is renowned for their quality. They are simply one of the top longboard brands out there. Skateboarding forums are full of avid riders who sing these boards praises. An example of the quality that is put into these longboards is the aforementioned Bamboo Totem longboard. This board is designed with five plays of laminated bamboo. This means that the board is going to be strong and stiff. Combine that with the Bear trucks and the Monster Hawg wheels, and it becomes clear to see why riders can expect high quality from Landyachtz longboards. The wide diversity available in these boards can be seen when looking at the Landyachtz Evo. This board boasts one of the most unique designs on the market. Built with a deck that has 11 ply maple construction, the Evo has captured more wins than any other board in the last five years of downhill racing. When a person thinks of a high-end vehicle, one of the first names a pop into their minds is Lamborghini. They are expensive, they are well-built, and they are known for having over-the-top features. Well, when a person thinks about the Lamborghini equivalent of longboards, Loaded longboards would be that board. Everything about these boards is over the top. Loaded quickly has set itself apart from all other longboard companies as providing the highest quality, best-performing longboards in the industry. However, as with all things that are of good quality, they are a little bit more expensive. One of the higher end longboards that this company produces is called the Chubby Unicorn. Funny name, right? But this board is no laughing matter. When it came to designing the Chubby Unicorn, Loaded spared no expense. First, they dedicated more than three years to research to develop the board. Then, they selected only the highest quality material for its construction. The result is a longboard that is second to none. Riders who want to experience longboard perfection should expect to pay between $460 and $500 for this board. When it comes to quality, there are few boards, if any, that can match the Chubby Unicorn. It is just that good. It is the most renowned, legendary freeride downhill board available. In the same way that a Lamborghini owner is proud of their vehicle, owners of the Chubby Unicorn consider it to be a matter of pride. If you choose to purchase Loaded longboards, know that you are purchasing one of the best longboard brands available. They are worth the money. They will never let you down with quality. In short, we have reviewed boards that are perfect for beginners, boards that are perfect for individuals looking for a unique design and boards that are perfect for experienced riders looking to get the best board out there. Not only does Arbor make exceptional longboards but it is also one of the most active ”green environment” brands in the world. With the Arbor Day Foundation, which is the biggest non-profit membership organization in the world, with over a million members. The goal of the Arbor Day Foundation is to promote and preserve the growth of trees and forests all over the world. Which I think we can all agree is an admirable goal. On top of their own organization, they also donate heavily to the Surfrider Foundation and Grades of Green. Surfriders aim to protect the oceans and the Grades of Green aim to educate young people on environmental issues. Their activistic agenda can be spotted throughout all of their products. From snowboards to skateboards, they are all made of quality, recycled material. However, this does not take away from the performance or quality of their products at all. Known especially for their Axis bamboo longboarding line but they offer anything from the ideal downhill board to incredible mini skateboards for carving. So if you want a quality longboard, but also want to give a little bit to a greater cause, then Arbor is definitely the way to go. Santa Cruz is well known for making excellent, yet inexpensive urban longboards for tricks and carving. It is unlikely that you will ever go to a major skate park anywhere in the world without seeing at least a few Santa Cruz boards. They are not as well-known for high-end quality boards, but they are masters of their own particular niche. Which is affordable, urban skateboards. They are also renowned for their art style, which is usually made by talented street artists, giving their boards that unique urban feel. Which is why they are closing in on half a million followers on Instagram. I would happily recommend Santa Cruz as a brand to anyone looking for a great longboard for city use. So if you love carving and tricks, or maybe just want to improve on it, then Santa Cruz is ideal for you. Atom was founded by actual longboarding enthusiasts, which provide them with expert knowledge of how to craft a fantastic longboard. Knowing where it is okay to cut corners and where it definitely isn’t is what makes Atom such a phenomenal brand for longboard beginners or people on a budget. Known in particular for their drop-deck and drop-through board series but have also made several awesome pintails and kick tail boards. If you are looking to get some real value for your hard-earned money, then I strongly recommend you look for the Atom brand when shopping for a new longboard. This brand is the real-life depiction of the California coastal culture. Based out of Santa Barbara, California, which is one of the skateboarding capitals of the world, and it really shows in their products. Famous for their unwavering quality and expert knowledge of the craft, few brands are as reliable as Surf One. They are not only known for the incredible boards but also their expert accessories. If you want high-quality helmets, clothing, or other pieces of longboard equipment, then Surf One is a sure fired way to get the best stuff out there. Surf One’s Robert August line is world-famous for being one of the best series of longboards ever made, which I can personally vouch for. My own custom made Robert August 2 longboard is still among my absolute favorite out of my entire collection. Gold Coast in Australia is not just one of the biggest cities of down under, but also one of the top travel location for longboarders in the entire world. As someone who traveled to the Gold Coast for that exact reason, it is easy to see why. The city is filled with awesome skating facilities and parks, while the surrounding landscape is just beautiful and has just about any kind of terrain you could possibly wish for. So it should come as no big surprise that Gold Coast is also among the best longboarding brands in the world. It is a truly self-made brand, with everything from the bearings to the wheels are custom-made by Gold Coast themselves. This makes their skateboards truly unique and gives them their own one-of-a-kind feel. With a lot of brands buying trucks, bearings, and wheels from China it is truly refreshing with a very brand like Gold Coast. Their line of cruiser boards is in particular famous and with good reason. I’d struggle to name a brand with as awesome cruising longboards at a very reasonable price. Founded in 1885, Globe is definitely one of the most experienced brands on the block. Which is why they don’t really specialize in 1 particular type of board, but rather have something for everyone. No matter your budget and no matter what kind of longboard you are looking for, Globe is sure to have something that will suit you very well. Well over 30 years in the business has given them expertise that few others can match, which is why they manage to excel at crafting longboards of all types and price classes. Reliable is really the best way to describe Globe as a brand. Whether you have a large or small budget, and whether you want an awesome pintail board or a cruiser, Globe is very likely to have exactly what you are looking for. Krown has never hidden the fact that they aim to make quality skateboards for people on a budget, and they do that very well. They are pretty much the budget version of Gold Coast, as they make every single accessory and gimmick related to longboarding themselves, but are more budget-friendly. Being cheap is rarely a huge selling point, but for all those people who are looking for their very first board, it is probably a good idea to look into cheap options. It is a great way to test the waters and to see skating is something for you. Krown is also awesome for those who need some sort of accessory but don’t wish to pay for high-end equipment. So if you want some extra wheels, a new helmet or gloves without breaking your budget. Krown is an excellent brand to check out. Cori Schumacher, Jennifer Smith and a whole host of other female longboarders have proven one thing. When it comes to bombing the big hills, cruising through the neighborhood and shredding, girl longboarders are just as dominating of a force as their male counterparts. Because of this, they are looking for longboards that fit their style, fit the attitude they bring to the sport and feel right under their feet. With more and more girls becoming interested in longboarding the question could be raised, is there a girl longboards? So, are there longboards that are better for girls? Absolutely not. In the same way, that guy boarders have their own style and wish to achieve differing goals while on their board, female riders are going to have their own style and different objectives they wish to achieve while on their boards. This means that no board is going to be the perfect board for girls who are first starting out. That being said, there are some characteristics that all longboarders, including the gals, are going to want to look at when selecting a board. If you are looking for the best overall longboard for girls, stop your search here because you will not find it. However, if you are looking for the best longboard for you, “seek and ye shall find”. Look for a board that matches your style, your attitude, and your experience level, and you will find it. Get more space while cruising at the level high with the Quest Super Cruiser Artisan Bamboo Longboard Skateboard. The 44-inch huge artisan bamboo deck will keep you attached and provide you all the insane turns and cruising that you love to. It’s built like a tank and rolls like a ball. It looks great and its strong, durable design means that it is a great board for beginners and intermediate riders alike. The elegant design and shape of the wide deck make you feel stable while providing you the comfort you seek. It’s reliable and smooth for getting some freeriding and downhill as well. Plus it provides all levels of rider a different taste of skating with its amazing features and unmatched performance. The Atom Pintail Longboard is a great entry-level longboard at an amazingly great price. The classic pintail deck shape and concave cross-section make carving a breeze. It’s an ideal choice for those who wish to make the most out of their skating and feel confident while doing so. This classic 39-inch offers an easy-going, relaxed vibe of the true longboarding spirit while having fun at the same time. The wonderful design, classic shape, and high-quality hardware serve to complement the deck in all the best ways. This is definitely an amazing board to give your kid as their first board, and also serves as an excellent choice for newbies alike. A classic board from the renowned Sector 9 brand, the Lookout Complete earned its fair share of street rep with its aerodynamic shape, drop-through design, and flexible bamboo abstract. At 42 inches, this board offers plenty of room for any stance. The shape of the board is narrow at each end and wide in the middle, which allows for the board to take extreme turns without the board ever rubbing against the wheels. The board itself is made from 5 Ply bamboo giving it just enough flex for the average person. Plus the Lookout gives you the response and maneuverability you need to get around with ease. A must-have for every fan of The Endless Summer, this very versatile yet solid board utilizes the Surf One clear grip to show off Roberts classic colors from yesteryear. This gives the board a classic 70’s feel and look. This super cool, retro looking skateboard is perfect for beginners and intermediate boarders alike. The painted stripes give the board a unique feel that will never go out of style. The board brings with it a good amount of flex for easy riding and carving. The maple wood deck construction is also sturdy and long-lasting. Plus the board comes with premium quality Randal R-II trucks for a smooth riding experience. Yet another top-notch longboard designed by the world-renowned Sector 9 brand, the Fractal Complete will offer you very easy cruising, high performance turns and made for all kind of riders, while providing excellent maneuverability and stability. The first thing that catches the eye is the stunning visuals that are beautifully painted on the deck. Besides the eye-catching design, the Sector 9 Fractal has a pintail deck constructed out of 8 Ply Maple with drop-through trucks. Besides, the Gullwing Sidewinder trucks help to turn and cruise around easily. Plus this board can turn on a dime without any wheel bite or wheel lock issues. The board is extremely lightweight which makes it really great for high-speed riding. Another classic mini shape in the Fundamental series, the 83′ packs a big punch in a small package. With its classic design and graphics a reminiscent of its name, it is the perfect throwback cruiser. The classic Sector 9 cruiser skateboard is just the thing for you if you have an endless fascination towards the relics of a classic touch accompanied with the vintage ethnicity. Being a cruiser board there’s no kick on the nose and is easy to do old school stunts such as jumping off cuts and riding through skate parks. The board is the derivative of high-quality maple wood that will provide you with much-needed durability and structural integrity. A true all-around cruiser skateboard straight from the shaping room of Santa Cruz Skateboards, the Sugar Skull Shark Cruzer is built to perform. The Sugar Skull is the perfect smooth ride for carving the streets or just having fun in the back alleys. It comes equipped with Bullet B137 Trucks for better control and the 65mm 78A Road Rider wheels make sure the board rolls smoothly over the roughest ground. The swallowtail shape has a kick tail and upturned nose for better maneuverability, plus the directional platform has radial concave for foot support. The Sector 9 Meridian Complete Skateboard is primarily designed for easy commuting and carving thanks to its drop through construction and 8 Ply maple, while also featuring Sector 9’s Taco Mold concave so your feet are locked-in if you decide to get a bit crazy. The Meridian’s got a great standing platform with a moderate amount of concave, perfect for newbies and intermediate boarders alike. And for those of you with wild-style base plates on your trucks of preference, the Meridian is comfortable with nearly anything you can dish out. If you’re looking for a classic style drop-thorough board that you can use for free riding and commute, then the Sector 9 Meridian Complete does not disappoint. The YOCAHER Drop Through Complete Longboard is specifically designed for speedy trips. The lowered platform allows for greater stability at higher speeds, while the shape is designed ideally for the rider looking for more support on hard turns. Both beginners and intermediate boarders can use it for cruising, commuting, sliding, carving and going downhill. The drop through design makes pushing a lot easier, offers more stability at extreme turns, and makes sliding effortlessly. Plus the cutout on the deck allows for maximum wheel clearance. The concave curvature ensures that both the heel and toes of the foot of riders remain locked with it. The Magic Union 41 Inch Drop Down Complete Longboard is great for commuting the metropolis with a pleasant mood as well as cruise the extreme outdoors. The Magic Union is the master of the pioneers of skateboard makers. While not a huge brand like Sector 9, it is well known for putting safety first. The brand always offers utmost safety by using wood, aluminum or plastic. The drop-down deck offers more stability, better turning control, and easy push off. Less distance to the ground for easy push off also helps lower fatigue. The flexibility of the deck can absorb any kind of strain and provide even riding on a rough surface. This is great longboard for those aiming to commute and carve around. The Sector 9 Faultline Complete Skateboard is the epitome of what a good downhill board should be. The Faultline is a dropped platform downhill board that is craving maximum speed. The dropped platform is sure to not only lock your feet in but also feature a way to make sure you are in the perfect shape for your speed tuck so that you’re as aerodynamic as possible. The nice thick 9 Ply deck with a slight drop down gives you something to push against during those ridiculously long slides. The Faultline has a 0.625 drop that helps to lock your feet in for better-controlled drifts and slides. The Genesis Premium Complete Longboard is Arbor’s most versatile longboard drop through made to freestyle, cruise or Freeride and it is set up with the best components in the market. If you’re looking for your first longboard, something that’s easy to cruise, commute, this prime board is definitely the thing for you. Roll your way freestyling and carving to your favorite tunes with this fantastic freeride board. It has drop through mounted trucks that get you closer to the ground for added stability. The deck’s generous wheel cutouts and double kick mold give you plenty of options for flip tricks, making the Genesis a nimble ride for all your free-style and flat-ground needs. Being one of the most popular cruiser boards around, the Arbor Complete Axis KOA Longboard is a lively, snowboard inspired shape that inspires confidence not only for its large and stable wheelbase but also for its ample foot room that provides extra leverage in all the right places. The symmetrical shape is inspired by Arbor’s snowboard designs and allows you to ride equally well from either end. The top bamboo play makes the Axis slightly more flexible than traditional maple decks. Thanks to its drop through design, it’s easy for pushing. Additionally, the KOA top sheet gives you both aesthetics on the top as well as the bottom of your board. The latest iteration of the Tan Tien Flex line of longboards features a newly engineered wood bottom veneer and new grip design with an added tail giving it more maneuverability. The deck is a drop-through design which means the board is lower to the ground which provides more stability during high-speed downhill racing. The deck itself is made out of high-quality bamboo and fiberglass with a reinforced nose and tail to ensure maximum durability. The complex contours create a super responsive board that allows for increased confidence when leaning into extreme turns, popping tricks, and powering through slides. All the technology and craftsmanship that has gone into this very versatile board makes it one of the most complex boards made to date. The Dervish was Loaded’s first venture into drop-through construction and an opportunity to create a flexy, bamboo composite carver with the versatility to handle a variety of riding styles. The Dervish Sama was born from the original Dervish that gave fame to the Loaded Longboards brand. This is the rebirth of a classic which has everything you love about its predecessor with a few new twists that make it an amazing new board. The Dervish Sama is a fun and super flexy board that will give you an awesome surfy feel. It has a pretty fair amount of flex that can be customized further with the multiple flex options that Loaded offers. Krown Rasta Freestyle Elite Complete Longboard is a great entry-level board for newbies and recreational riders alike. It is the made by the same company who brought us the Krown Sunset City Pintail – the same company known for its excellent craftsmanship. It already distinguishes itself from other longboards due to its funky colors and vibrant graphics. The drop through design is a favorite among riders looking for speed and a lower center of gravity. The low center of gravity keeps the board stable at high speed and easy to slide. The deck is made out of Canadian Maple, which is known for its sturdiness. With the drop-through trucks, this board is particularly good at handling high speeds and bombing hills. The trucks provide the necessary stability to avoid speed wobbles which can throw you off of your longboard. Few brands are as renowned for their bamboo boards as White Wave. Their bamboo series is a phenomenal place to start out but is also well suited for the more experienced boarder. The deck is not quite as flexible as many others on this list, which makes it a little less useful in sharp turns and when doing tricks. However, it makes it incredibly stable and quick, making it excellent for adrenaline seekers and downhill enthusiasts. Furthermore, the stability also makes a good choice for novices. One downside that I have to mention is the bearings, the ones that come with the board slows the board down a bit which is a shame. That being said, if you throw a few extra dollars at some new bearings, it is one of the fastest boards out there. Overall, a very smooth ride, with the only downside being the bearings. Up until this point, we have briefly reviewed the different styles of longboards available, their usage, and the different companies that produce these longboards. Now we are going to focus our attention on how you, as a customer, can choose the right longboard setup for yourself. The following are things that you may want to consider. The first question you going to have to ask yourself is, where is my skill level at? As you have seen in this guide, there is an endless variety of boards when it comes to styles and setups. Each setup is designed to match the skill level of the rider, with the hope of making their riding experience enjoyable and easy. This means that a newer rider is going to want to make sure that the shape of the board they purchase, the mounting type, and the flex of the board is suited to their skill level. Something that hits new riders as a surprise is that even with longboarding, there are different styles of riding a board. For example, someone might just want to cruise around their neighborhood or skate around their school campus to and from the class. Or another individual might want to skate on a drainage ditch, at a park, or dive down a hill at full speed. Each one of these approaches is going to be made easier by using a different style of board. So prior to purchasing a board, you need to take into consideration where you live. For example, a person who lives in Apple Valley, Minnesota is not going to be bombing too many hills. Conversely, an individual who lives in Arizona might find themselves hitting a mixture of hills, flatlands, and everything in between. Carving/Cruising: Carving and cruising are all based on the ability to carve your way down streets that slope gradually. Hustling your way at full speed through the crowd on your way to class, and going the distance using pushes on flat land or ground that has a very slight slope. This type of boarding is what most beginners do when they borrow their friend’s board for the first time. Downhill: Downhill longboarding is about one thing. That thing is speed. The goal is to bomb down the hill as fast as you can and at the same time maintain your control over the board. Usually, downhill riders are going to be crunched up or in a tucked in position in order to minimize wind resistance. Controlling your speed while you are going downhill can be a challenge. If it is not done correctly, it can actually damage your board. So this style of riding is not best for newbies. Freeride: The goal here is to ride in a semi-hilly environment with a lot of speed, while at the same time performing tricks up slides, on curbs, and other parts of the sidewalk. It takes a lot of control to be able to freeride, and so this style is usually reserved for expert riders. Freestyle: When it comes to freestyle, everything is an open game. Freestylers will use technical skills like sliding, while at the same time doing board tricks, dancing around, and just being goofy. This style of riding is perfect for anyone who is just learning how to ride a board and who wants to get a better mastery of the board. This is extremely enjoyable for advanced riders. Most boards fall into two basic shapes. Both can be used by experts and novices at the same time. Directional: These boards are designed to just go in one direction. The best example of a directional board is a Carver/cruiser board, downhill board, and freestyle boards. Twin (Symmetrical): These boards are designed to look and to feel the same regardless of the direction that they are being used in. They are perfect for 180 degrees slides and are often used in freeriding and freestyle. Deck styles greatly influence the stability of the board. It also dictates how easy it is to stop the board and how easy it is to push along on flat ground. Top Mount: Top mount is the traditional shape for longboards, and it is the least expensive to purchase. While having less stability due to the top mount design, these boards are more nimble and have increased turn leverage. They are good for cruising, downhill, freeride, and carving. Drop Through: On these boards, the trucks are mounted on the board, and as a result, the deck height is lower. The boards are more stable, and riders experience less fatigue while pushing the board and breaking. This style is excellent for long-distance riding. Drop Deck: The decking of these boards is nontraditional in that through the molding process they are designed so that the rider’s feet sit below the truck areas on the board. As a result, the board’s center of gravity is lowered and the rider has less fatigue when braking and pushing. These boards are perfect for downhill and freeride. Double Drop: These boards are designed to get the rider’s feet as close to the ground as possible. This is done by incorporating both drop through and drop deck styles. These boards are used for downhill. Kick Tail: These are what you are going to see on the end of both sides of a regular skateboard. It is a slightly inclined area that allows the rider to lift the board off the ground and do tricks. These are a must on all freestyle boards. Wheel Cut-Outs/Wheel Wells: Both of these features are designed to prevent wheel bite. This is when the wheel comes into contact with the board when the rider cuts corners too hard. Cut-outs provide the most versatility because there is no way for the board to make contact with the wheel. Concave: In addition to the grip tape, the concave is what helps the rider stay on the board. The edges or rails of the board are a little higher than the board center. This allows the rider’s feet to have the greatest contact with the board. This feature will be seen prominently in downhill and freeride boards. W-Concave: Similar to the concave, this feature helps the rider keep their feet on the board. Because of the shape of the concave, it is like having two concaves on the board. This feature will be found on expensive downhill and freeride boards. This feature plays a role in the stability of the board. Boards with a longer wheelbase will have more stability at higher speeds. The disadvantage is that they cannot turn as fast as boards with a shorter wheelbase. Veneer: The most common and the least expensive style of board construction is where multiple thin sheets, referred to as veneer, are glued together and stacked on top of each other. Then they are pressed into the shape of the board. The number of veneers that are used is going to differ depending on the styling and maker of the board. However, it is generally thought that the more veneers the board has, the stiffer and less flexible it will be. Bamboo: Some boards are constructed using bamboo laminates. In this process, a sheet of bamboo is put in between fiberglass or some other composite material. The result is a board that is medium to lightweight and that has medium flex. Carbon fiber: The third style of construction is boards that are made of composite materials, such as carbon fiber. These boards are more expensive, but they are extremely lightweight and extremely stiff. They are perfect for downhill riders. Longboard trucks are the part of the board that attaches the wheels to the decking. Unlike normal skateboards, the kingpin on the longboard trucks is inverse, allowing the longboard to have improved side to side movement and better stability. The nut on the kingpin can be adjusted in order to provide a stiffer or a looser feel when turning. Base Plates: This is the part of the truck that is connected directly to the board using hardware bolts. Hangers: This is the part of the truck that acts as an axle by pivoting on the base plate. It is also what holds the wheels in their place. Bushings: Bushings are rubber pads that sit between the kingpin, the base plate, and hangers on the truck. Each truck is going to have two bushings. The harder the bushing is, the more difficult it is going to be for the rider to turn. However, stiffer bushings will provide more return energy. 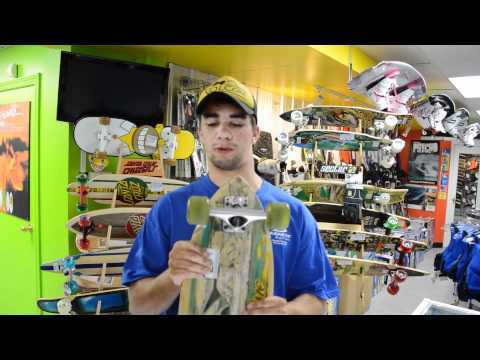 Check out our longboard trucks buyers guide. Shape: Longboard wheels come in two shapes. They can have lips that are round or lips that are square. Rounded lips are usually seen on a normal skateboard. They provide less traction through turns. This equates to a faster ride, and it is easier to slide using these types of wheels. Freestylers and freeriders usually install these on their boards. The second style is square lip wheels. The edge of the wheel is squared at a 90-degree angle. This means that the wheel has improved contact with the road and has increased traction and sliding resistance. These wheels are perfect for bombing downhill or for cruising/carving. Width and Height: Oftentimes referred to as the diameter of the wheel, this is the distance between where the wheel touches the ground and the top of the urethane. This distance is often measured in millimeters. The larger the wheel, the smoother the ride is going to be and the less amount of effort the rider will have to use. Conversely, acceleration with larger wheels is slower. Durometer: This is the gauge of how hard the wheel is. The hardness of a wheel is going to be listed in its name. For example, the name of the wheel will be listed followed by a measurement in millimeters, which will be followed by the letter A or B. The letter A signifies a softer wheel, while the B signifies a wheel that is made of a harder plastic. The softer the wheel, the more traction you get. However, the ride will be slower. The harder the wheel, the less friction you have. You can travel faster, but the road will be bumpy. Core: The core is the center of the wheel. They can be divided into three different categories, center set, offset, and side set. Center set is the most common core on skateboarding wheels. It is symmetrical and allows the rider to flip the wheels once one side becomes worn down. Offset cores are a little off-center and a little closer to the inside of the wheel. This allows the wheel to have a good balance between grip and slide ability. Sideset cores are located very close to the upper-lip of the wheel. Because of this, the rider can slide easily. The only downside is that these wheels cannot be flipped once they get worn down. Check out our longboard wheels buyers guide. Bearings: The bearings are what make the wheels spin. The standard rating for bearings is ABEC. The higher the rating, the faster your wheels are going to spin. Proper maintenance on bearings is essential because they play an important role in the performance and durability of your board. Bearings should be cleaned and lubricated after every 50 hours of riding. Check out our longboard bearings buyers guide. Longboarding vs Skateboarding: Whats the difference? A lot of people write of longboarding and skateboarding as the same thing and it is easy to see why. To the untrained eye, it seems incredibly similar, but the truth is that there is a lot of important differences between the two. Allow me to explain. This is the most obvious way that longboards differentiate themselves from skateboards. Whereas a skateboard is usually between 28-34 inches in length and 7-10 inches wide, a longboard is much bigger and is typically between 35-60 inches long and 9-10 inches wide. The difference is size is more than just a visual difference as it creates very different boarding experiences. The longer and wider design of the longboard make it a lot better to balance with and easier to maintain control of at high speeds. While the more compact skateboard makes tricks and carving a lot more manageable. Skateboards also have a very distinct upwards design on both ends, which is also with the intention of making tricks such as kickflips and ollies easier to perform. Whereas longboards have many different shapes such as pintail, drop deck etc. All of which has 1 thing in common, 2 narrow strips at each end which makes the board easier to freestyle cruise and balance on. Longboards have softer and more flexible wheels and trucks, which makes them much more absorbing to cracks and obstacles on the road. The deck is also broader and more flexible which makes cruising a lot more comfortable and sharp turns a lot easier. The wheels are also bigger which again add to a smoother ride. Skateboards have smaller and harder wheels and trucks, while this makes it very vulnerable to holes and cracks in the road. It also makes the board much easier to do tricks with. Skateboards are far superior to making tricks and carving but longboards are superior in almost any other way. They are more comfortable and create a much smoother experience. Longboards also handle high speeds and obstacles much better, which is why it is the choice of most professional downhill skaters. So if you want to master tricks such as the ollie, you are most likely better off with a shortboard, but if you want to cruise, commute and everything in between, the longboard is the right choice for you. Because of the inherent safety concerns connected with using a longboard, it is wise for all riders, but especially newer riders, to use safety gear. Full-Face Helmet: This type of helmet is designed for high impacts and will protect the entire head. Individuals use this helmet when downhill racing. Helmet: Designed to protect the rider’s head, the helmet is an essential part of longboard equipment. If not the most important one. Check out our longboard helmet buyers guide. Leathers: Individuals who are serious about doing downhill racing will need to purchase a leather suit. In fact, the majority of professional races require the use of racing leathers. Pads: There is protective padding that is designed to protect every part of the skater’s body. It is a good idea to get padding to protect your elbows, your knees, your wrists, and the palms of your hands. Pucks: These durable pieces of plastic are designed to be attached to slide gloves and provide your hands with additional protection. Slide Gloves: These gloves will protect the rider’s hand and allow them to actually put their hand on the ground while riding at high speeds. There are many tricks that can be performed using these gloves. Check out our longboard slide gloves buyers guide. Frequently asked questions by our community. Q: Which longboard is your absolute favorite overall? A: Well, that is a hard question to answer really. Firstly, it would depend on which type of boarding I am looking to do on that particular day. With a personal collection of almost a 50 boards, it is hard to name one specific longboard. However, I do ride my Icarus Longboard from Loaded a little more often than any other. It is a bit on the pricey side but well worth the cost without a doubt and has been with me for a very long time. Q: What is pintail longboards good for in particular? A: The pintail shape is basically just a way to avoid wheel biting, but if I had to name one type of longboarding where I personally enjoy pintails it would be for regular cruising. Q: What is your favorite spot for longboarding in the world? A: That is an excellent question, but not one I can give just one answer to. I am in love with the Gold Coast in Australia and I try to go there at least once a year, it truly has everything one could wish for. I also love California, the culture at Santa Monica and Santa Barbara just screams ”longboarding”. However, my favorite adrenaline filled downhill adventure has been in Austria, you simply cannot compete with the hills and mountains there. If I had to recommend just 1, it would probably be the Gold Coast, as it has something for every type of skater. Q: What type of board sport are your favorite, outside of longboarding? A: Definitely surfing! Surfing is actually how I got started out with longboarding, as I needed a way to practice my board control and did live nearby any good surfing spots at the time. However, I quickly found myself enjoying my time on a longboard more than I ever thought I would, and the rest is history. Kitesurfing is also hella fun! Q: My son wants a longboard for his birthday, do you have any recommendations and how do I make sure he is safe when riding it. A: Totem from Quest is always a sure-fire hit among beginners, and won’t set you back too much financially. Safety-wise, it is simply important to at least get a helmet and maybe also some knee pads and gloves. As long as you don’t let him ride down some very steep hills those things will be more than enough to keep him safe. Q: Which material do you think is the best for longboards? A: Personally I prefer bamboo boards, the mixture between fiberglass and bamboo makes them incredibly sturdy while still being decently flexible and lightweight. Carbon fiber is probably the strongest and is better for more high-pressure situations, such as downhill racing. When making a buying guide such as this, there are bound to be a couple of great products that don’t quite make it unto the list but still did very well in the testing phase. A very nice beginner board that almost made our list. However, it is ultimately a budget board and roughly in the same price class as the Quest Cruiser, which it simply cannot compete with. I would say that this is a little better looking but overall it performs slightly worse than the Quest Cruiser. By no means do this mean that I wouldn’t recommend this longboard, it is a very inexpensive beginner board with a fantastic look. I would recommend the board from Quest first, but if you really like the look of this one( which I wouldn’t blame you for ) it is still a great option for the novice boarder looking for a great deal. A very unique looking longboard made of decent quality maple. This is once again a budget board, which is why it didn’t quite make our list. It was just a better fit for our list of the best inexpensive longboards. This cruiser is suited for you if you are on a budget but still want a very fast board. While the quality is not comparable to many of our other picks, it is one of the fastest budget boards on the market and deserves an honorable mention. While ”Free” are not exactly a famous longboard brand or even among our favorites, this one was a pleasant surprise. The upside to buying from smaller brands is that you sometimes get a lot of value for money, which is really the case here. Both deck and bearings are extremely durable and the board is decently smooth to ride. However, the big downside is the lack of flex in the deck which is really apparent when riding it on bumpy terrain. It suddenly goes from being very smooth to a very rough ride. So whether I can recommend this board really comes down to where you plan on using it. If you live in an area with bad infrastructure it is probably not a good choice for you. Still, a great value for money purchase that is worth considering. As can be seen, there is a lot for the rider to take into consideration when selecting the proper longboard. However, if the rider finds the board that is right for them, they are going to have an experience that is beyond compare. The joy and the sense of freedom that a rider experiences while on their longboard cannot be compared to anything. Our final words of advice would be, take your time, do your research, stay safe, and most of all, enjoy the ride. On all subjects, it is a good idea to have some reliable sources. This is some of the sites we used in the hopes of creating the best longboard buying guide on the internet. Tactics, Longboarding essentials, in-depth article about all the basics of longboarding. Tactics, choosing a longboard deck, an article about what to consider when looking at longboard decks. Adrenalinebeast, Downhill longboarding: what you need to know, an article about the specifics of downhill longboarding. Disruptsports, the difference between longboarding and skateboarding, in-depth explainer about the exact differences between a skateboard and a longboard. 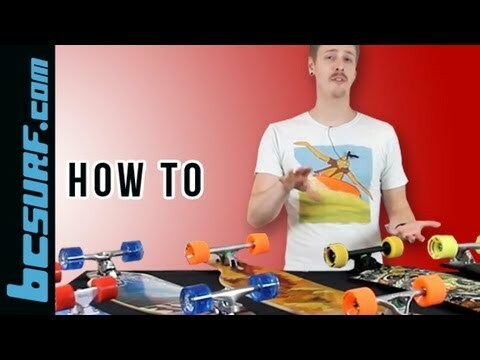 Warehouseskateboards, skateboard, and longboarding buyers guide, a professional guide on how to select the ideal board.